Thank you for purchasing Good News Plus. Before you get started, please be sure to always check out these documentation files. We outline all kinds of good information, and provide you with all the details you need know to use Good News Plus Theme. When done, you should see good-news-plus.zip (zip file name can be changed from version to version). Please, follow the steps below to install Good News Plus Theme. Step 4 - Choose good-news-plus.zip and click on the Install Now button. 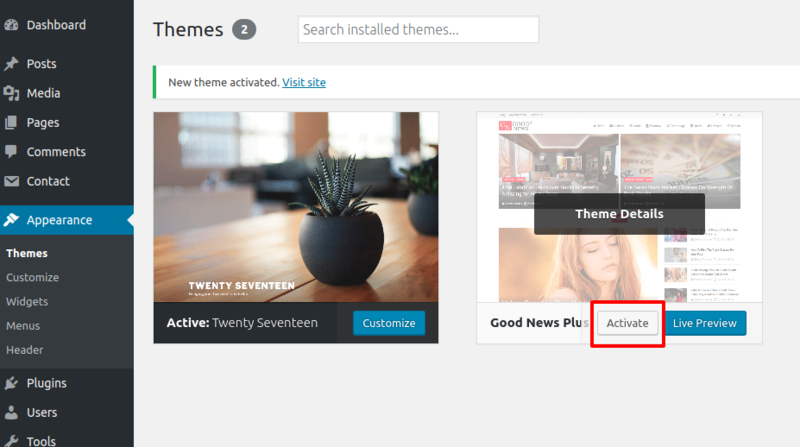 Step 5 - Wait while the theme is installed, when done Activate the Good News Plus theme. Step 6 - Congratulation you are ready to use Good News Plus, but first Activate your license key. If you get the "Are you sure you want to do this" message when installing good-news-plus.zip file via WordPress, it means you have an upload file size limit. Install the theme via FTP if this happens, or ask your hosting company to increase the limit. If you get an error saying that the stylesheet is missing, then you have uploaded the wrong folder. Please check that you are uploading the good-news-plus.zip within the Theme Files folder. Step 1 - Select static pages as front page and posts page from list as shown below. When done, you should see good-news-plus.zip (folder name can be changed from version to version). Step 6 - Congratulation you are ready to use good-news-plus, but first Activate your license key. Step 1 - Go to your WordPress Appearance > License. Step 3 - The final step is to click on Activate button. Step 1 - Go to your WordPress Dashboard and click on Begin installing plugins. Before importing the dummy data Make sure you have installed all the required plugins. Step 1 - Go to Appearance > Demo Setup. Step 2 - Click on the Import Demo Data button. Step 3 - Done! Menu and Home Page will be set automatically. Before using the widget make sure you check the features it offers in below description. Here you can add category post listing and multiple designing layouts available in it,that you may want to make website beautiful. Here you can add category post slider with awesome designing and responsive as well. Q.1 - How to create static pages or how to modify the imported page layouts? Step 1 - Please go to SiteOrigin Page Builder Documentation to check how it works. This will help you in creating new static pages as well as modifying the imported ones. Q.2 - How to upload logo and site icon? Step 1 - Please go to Appearance => Customize => General => Header & Logo menu. Step 2 - Here you can change your logo along with site icon and also add or remove site title and it's tag line. You can enable or disable the fixed header and change the normal and sticky logo size as per your requirements. Q.3 - How to manage preloader? Step 1 - Please go to Appearance => Customize => General => Preloader menu. 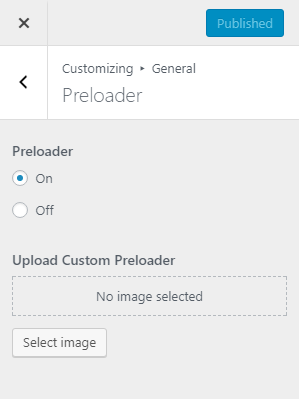 Step 2 - Here you can enable or disable the preloader and also, you can upload the custom preloader. Q.4 - How To Integrate Social Icons? Step 1 - Please go to Appearance => Customize => General => Top Header Social Accounts menu. Step 2 - Here you can integrate your social accounts in top header section. Q.5 - How to change colors? Step 2 - Click on color icons and change colours as per your requirement. Q.6 - How to Blog Page settings? 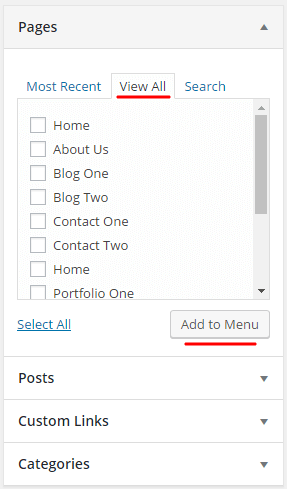 Step 1 - Please go to Appearance => Customize => Blog Page Options Settings menu. 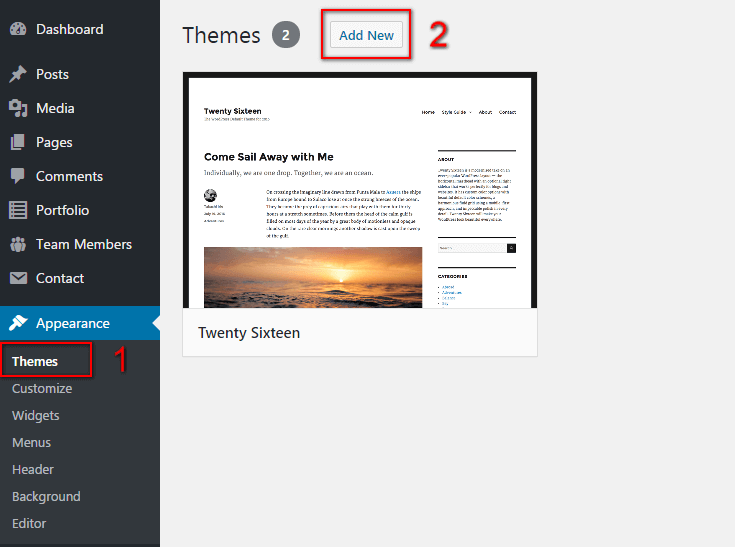 Step 2 - Here you can display the latest blog (archive) in home page template using post categories. Also, you can show & hide your latest blog sidebar area in it.Many other option for single post and single page. Q.7 - How to manage your footer? Step 2 - Here you can choose whether to show or hide your footer widget area along with the number of columns to show. If you want to add a copyright text in your copyright area then you can add it from here. Q.8 - How to manage sections on Home Page? Step 1 - Please go to Appearance => Customize => Widgets Settings menu. Step 2 - Here you'll find all the section of home page which you can easily edit. All of them are managed by Post Categories. You can assign a category as per your requirements.